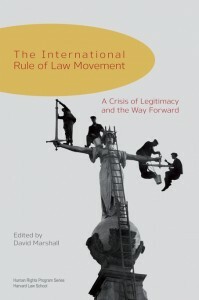 Ahead of its LSE launch on Thursday 26th June (6-7.30pm, Room 1.04, New Academic Building, free and open to all), editor David Marshall introduces The International Rule of Law Movement: A Crisis of Legitimacy and the Way Forward, which includes a new chapter by JSRP researcher Mareike Schomerus. In 2011–2012, I was deployed to South Sudan to lead the United Nations’ development of the country’s justice and prisons system. It was a startling experience. Though the international community has been engaged in rule of law reform since 2005, there was a profound knowledge deficit regarding the justice “system,” its actors, and its processes. Moreover, there appeared to be little interest in understanding, or learning from, years of international rule of law programming in the country—what worked, what did not, and why—or in applying lessons learned from similar contexts. Much of the assistance focused on “law and order” issues, with most support going to police and prisons. The international community’s rule of law assistance seemed trapped in an “impoverished” view of the rule of law and appeared to have little, if any, impact in actually addressing injustices in the country. The experiences in South Sudan are replicated in other postconflict and fragile states, where unprecedented international attention is being placed on state-building, with a primary focus on rule of law reform. Enormous amounts of money and effort are being dedicated to rebuilding and often changing entire justice systems, with modest success. This attention raises profound questions about the objective, approach, methodology, and consequences of these efforts. The evidence suggests that trying to change legal systems in these states is an unproductive endeavor. The causes of the movement’s lack of success have remained constant—unrealistic objectives, misplaced doctrinal approaches, insufficient expertise, poor planning and execution, and a lack of deep contextual knowledge. Although the seminal works of Thomas Carothers, Erik G. Jensen, and Thomas C. Heller call for focus and modesty, the international rule of law movement remains undeterred from adopting “comprehensive,” whole-system approaches. This chronic lack of success, the recycling of bad ideas and the bloated rhetoric regarding the centrality of rule of law to achieving “the good life” led to the development of a series of papers that, in turn, became an edited volume exploring how the international movement could possibly extricate itself from the situation. The International Rule of Law Movement: A Crisis of Legitimacy and the Way Forward (Harvard Human Rights Program/distributed by Harvard University Press, 2014) addresses a multitude of conceptual and operational questions. What are the assumptions underlying the rule of law? In what way does the technocratic positioning of the rule of law blind us to the problematic aspects of creating law for others? In what ways does rule of law reform work clash with state sovereignty? What does it mean to seek to rebuild a justice system from the ground up? Is rule of law reform antidemocratic? Is the enterprise so flawed that it is impossible, or is it morally and ethically sound but hobbled by poor systems and flawed processes? Operationally, can identifying goals and defining success help us improve rule of law work? How can we better capture and manage our rule of law knowledge? What have been the successes of locally driven, “light footprint” interventions? And how can we best identify and support local priorities, initiatives, and solutions? This piece originally appeared on the website of the World Justice Project. Note: This article reflects the views of the author alone, and not the position of the UN, the Justice and Security Research Programme, nor of the London School of Economics. David Marshall is a staff member of the Office of the High Commissioner for Human Rights in New York. With a background in criminal law and international human rights, he has been working on criminal justice reform issues for more than twenty years. He has extensive field experience in post-conflict states, including Afghanistan, Iraq, Kosovo, Nepal and South Sudan. In 2011, he was appointed the UN’s first head of its Justice and Corrections Standing Capacity, a rapidly deployable entity charged with developing justice strategies in new UN peacekeeping missions, such as South Sudan. He is a graduate of the University of Leeds and Harvard Law School.